15 mm carbon fibre rails for DSLR Rig There are 10 products. 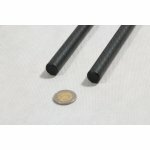 Specially designed 15mm carbon fibre rods for DSLR rigs. 2 pieces of the same length.